£500 to relaunch the Tree House! We have had some fantastic events in the last few weeks. A brilliant evening with Andrew Davies, discussing his recently-aired adaptation of War and Peace on the BBC, some fabulous music events, one of our best ever Tree House Sessions (open mic), and all of these as well as the regular and lower key events produce a kind of alchemy, bits of gold dust that float in the air and embed themselves in the fabric of the place. Harder and harder to face closure. A couple of weeks ago Carole Donnelly from the Inspiration Club came to talk to me about becoming a Social Enterprise and to help me assess what possibility there might be for taking the venture up a level in terms of creating more substance in what we do and offer and raising our potential revenue. This was an extremely helpful and practical meeting; I am still working through the list of tasks we devised, but have done enough already to realise that I still feel that deep excitement at the thought of making the Tree House better and better as well as more profitable. Did I mention that the finances are critical? I have not earned any income from the bookshop since November, and have never taken very much from it since we reopened in more expensive premises. But I have to earn an income. I do still have health issues, not least my severely arthritic knees which now make walking, standing or doing any physical activity for more than a couple of minutes extremely difficult and very painful. That’s by the bye in one sense, but a factor in my deciding what else I could do. It would be hard to get another job. And I have the opportunity at the Tree House to do something very worthwhile, very rewarding, very interesting, even exciting. Not many jobs that I feel qualified to do would give me that. They would, however, give me a regular income…and while I don’t want to keep harping on, that is crucial as part of any plan for the bookshop. I have spent a lot of time since talking to Carole thinking through all the issues. Things occur that raise my spirits one day and then dash them the next. Sometimes the rollercoaster rises and dives on an hourly rather than a daily basis. But the positives outweigh the negatives, I have realised as the days have gone on, and while there is much hard work ahead, I feel the need and the desire to carry on getting stronger, despite regular setbacks. So the Tree House is about to be relaunched. We are now calling ourselves a Social Enterprise, and this will become our official status in due course – the application to change from a limited company is in process. This will open up various advantages and opportunities, and make it completely transparent that we are a non-profit community venture. I will be launching various fundraising projects over the coming days and weeks. Many of you have given in the past, and continue to give now, and I have no desire to make anyone feel they are being asked for yet more money. But we now have 2500+ followers on Twitter, 1350+ on Facebook, and a new status, all of which may help us to raise some funds to set us on our way again. But I do also take extremely seriously the commitment to our supporters, financial and otherwise, over the last three years and those who might help us now and in future. With the new status will come some new organisational improvements to the shop, a rethink about our events and how best to use the shop space, new ideas for what we can offer the community near and far, and above all no further talk of closing. The details of these things will become apparent or be made public in the fullness of time, but this week I am launching a few things to help us meet a shortfall in our outgoings (rent, rates, utilities, accountant’s fees). We need to raise £500 quickly. We need to find £1000 as soon as we can. I hope to do this in creative ways – but if you want to help, you could simply share what we do and the needs we have and help us raise awareness of our existence and what goes on. If we could get a few more to our events, sell a few more books each day, that would be a great start. I don’t expect something for nothing – I am thinking up ways to offer some good value enticements that will bring people to the bookshop and reward those who have been such faithful supporters of what we’re doing. If I can work out how to do it, I will add a Paypal donate button for anyone who does want to give…but it’s just as important to spread the word and tell your friends about our events and our cheap books and our community spirit. More soon on a few events and offers to raise some money this coming week. Thank you to everyone who has supported us so far, and encouraged us in a time of despondency! It’s not going to be easy, but worthwhile things are often hard work. We have a brilliant team at the Tree House, and a wonderful core of regulars, many of whom have made friends because the Tree House has provided the environment for people to meet, share cultural experiences, feel involved, and just chat over cups of tea. We already are a community in ourselves, and I believe an asset to the community at large, and that’s too good to lose. 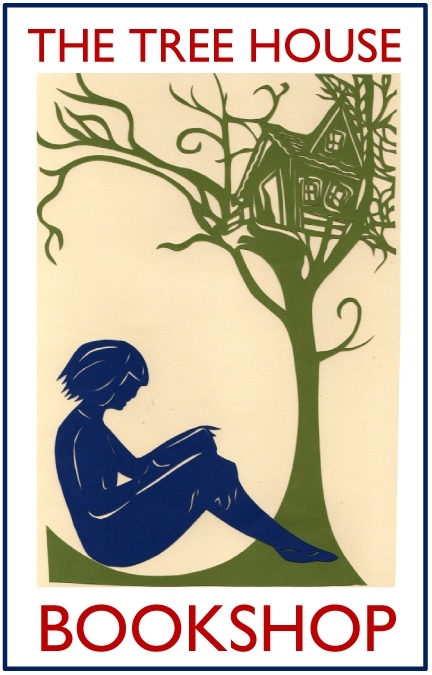 Our regular open mic evenings – known as the Tree House Sessions – are wonderful. A full evening of varied music, poetry, storytelling and great conviviality, all for £3, which even includes a £2 voucher to spend in the shop and a cup of tea/coffee. They are run by the incredibly lovely Lewis Smith and Charlotte Thomas, who aim to host them fortnightly – this doesn’t work exactly, but almost, and they have built up a great core of regulars with new people coming along all the time. We had one on Saturday 9 April, and it was particularly good – partly because the fabulous Kitty Macfarlane, who played at our very first open mic back in the old shop and is now making a very good name for herself on the professional folk scene, came along to play a few tunes, but it was a great night overall. We laughed, we cried, we sang (or hummed!) accompaniments, we chatted and enjoyed some excellent music and poetry. Lewis brought his camera and filmed the proceedings, and has made this lovely video, with one of Kitty’s songs from her new EP as the theme. It captures the spirit of the evening beautifully. If you would like to perform at an open mic, just email Lewis and Charlotte at treehousesessions@treehousebookshop.co.uk, and if you would like to join our band of eager listeners, just turn up. It’s £3 for performers and listeners alike. The audience is always very supportive and encouraging, and the atmosphere is always fantastic. In the meantime, watch this lovely film – thank you, Lewis! We are very lucky at the Tree House to have excellent landlords. They are a great family, who have creative ideas about using the building they own in the centre of town, and who treat all their tenants with kindness, respect and good humour. It’s rare to have such a great personal relationship with business landlords! 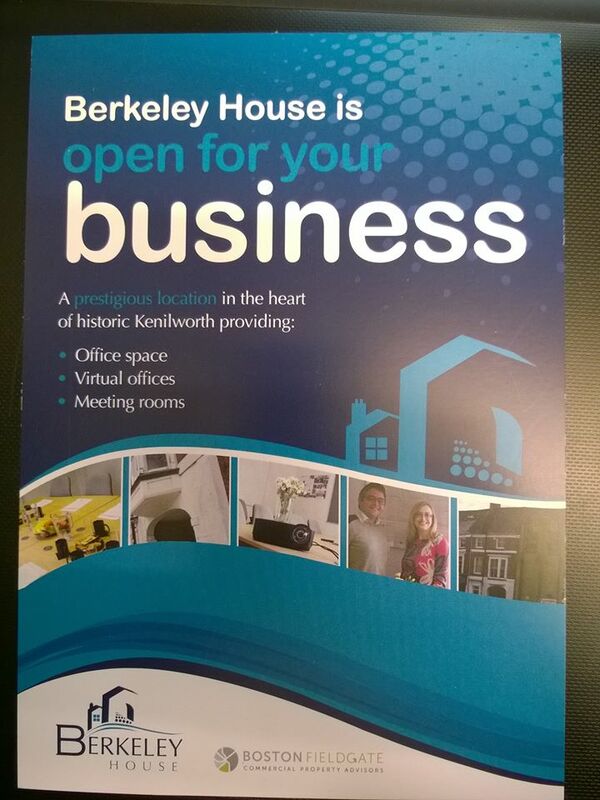 They are creating a really good business hub in Kenilworth, Berkeley House, where they rent out offices and have meeting rooms as well as owning two of the shops on Warwick Road. They have even gone a step further and are sponsoring us for a few months, as an extra sign of support – hence their roller banner in our window and leaflets inside. The family who own the building are involved in a number of international business initiatives too, developing technologies and training initiatives. You can find out more about what they do on their website. 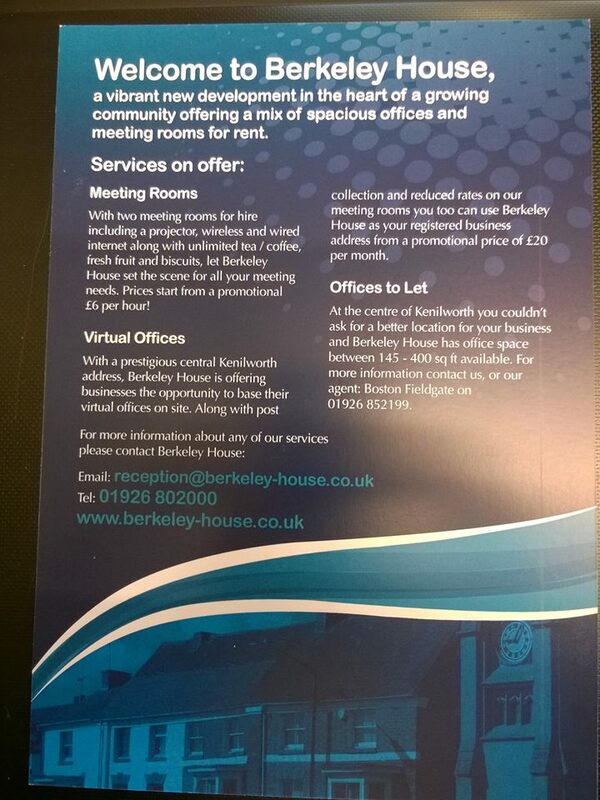 At Berkeley House, there are offices to rent in a friendly environment – not sure if there are any free at the moment! -and meeting rooms at good rates, and can also offer virtual office facilities. If you’re interested, do get in touch! There is a permanent link under the About Our Sponsors link in the sidebar on the right hand side of this main page.